Eaton senior Tyler Earley gains control of the ball during the Eagles soccer match with visiting Preble Shawnee on Tuesday, Sept. 11. Eaton rolled to a 9-0 win over the Arrows. Eaton senior James Howard has helped the Eagles to six straight wins. 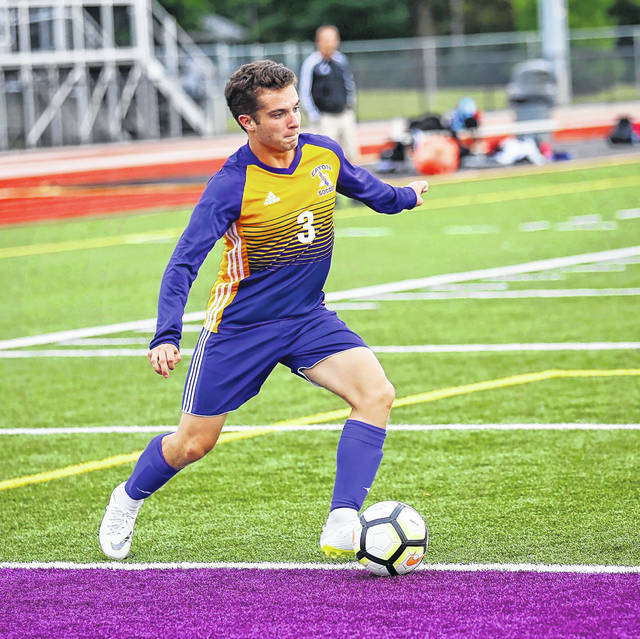 EATON — Eaton’s boys’ varsity soccer team capped its current six-game winning streak with a big win over previously unbeaten Talawanda on Saturday, Sept. 15. The streak started with a key win over defending SWBL champ Bellbrook. In between, the Eagles picked up wins over Franklin, Valley View, Preble Shawnee and Brookville. Eaton is now 6-2-1 overall and 4-2-0 in the Southwestern Buckeye League. The Talawanda win came in shutout fashion as the Eagles defeated the Braves, 3-0. Talawanda was 7-0 going into the match. Nathan Gard was key to the Eagles offense. Gard picked up the only goal of first half to put Eaton up, 1-0. Gard scored again midway through the second half, with the assist from James Howard. Howard netted a goal of his own to cap off the scoring, with a header from Owen Baumann’s assist. After struggling offensively early in the season, Eaton has got on track scoring 28 goals during the winning streak. The defense has been strong as well, allowing just six goals in that stretch, including two shutouts. Earlier in the week, the Eagles picked up wins over Preble Shawnee, 9-0, and Brookville, 4-1. According to the SWBL website, the standings show Monroe on top of the standings and still unbeaten in SWBL play. Oakwood, Bellbrook and Valley View each have one loss – and, Eaton has two losses. The Eagles were scheduled to play a key game on Tuesday, Sept. 18, at home, against Bellbrook. They will then play Franklin on Thursday, at home, and a non-SWBL contest against Kenton Ridge on Saturday, at home. https://www.registerherald.com/wp-content/uploads/sites/41/2018/09/web1_EATON-BSC-1-1.jpgEaton senior Tyler Earley gains control of the ball during the Eagles soccer match with visiting Preble Shawnee on Tuesday, Sept. 11. Eaton rolled to a 9-0 win over the Arrows. 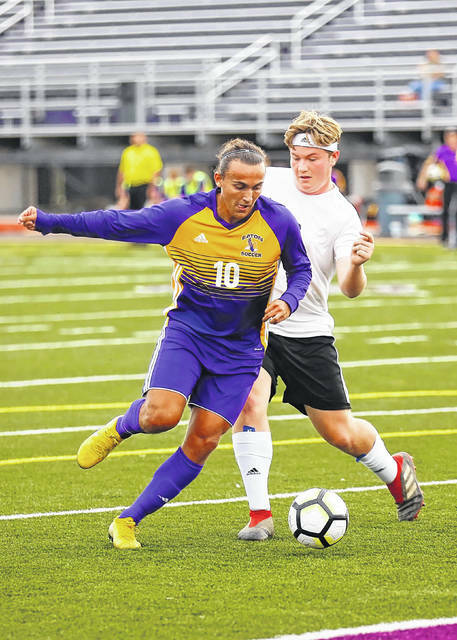 https://www.registerherald.com/wp-content/uploads/sites/41/2018/09/web1_EATON-BSC-2-1.jpgEaton senior James Howard has helped the Eagles to six straight wins.